Who doesn’t love chocolate? When it comes to a beloved treat, chocolate is a common favorite. But, unfortunately, there are consequences that aren’t that sweet! Don’t get us wrong, we’re not trying to rain on your parade. The truth is there are pros and cons to the delectable delight. For example, dark chocolate contains powerful cancer-fighting antioxidants called flavanols, but also includes cocoa butter which has high levels of unhealthy saturated fat that can raise cholesterol levels and increase your risk of heart disease when consumed in excess. So what could be a better option than dark chocolate? When it comes to fighting cancer, the answer is simple: Cocoa! One gram of cocoa contains over 30 mg of flavanols, whereas one gram of dark chocolate only contains approximately 12.5 mg. What’s more… one ounce of dark chocolate typically contains about 170 calories, 12 grams of fat and 10 grams of sugar, while one ounce of unsweetened cocoa powder contains only 70 calories, 4 grams of fat and virtually no sugar. 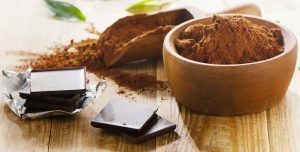 By adding powdered cocoa to your diet, you can reap its cancer-fighting benefits without the guilt. 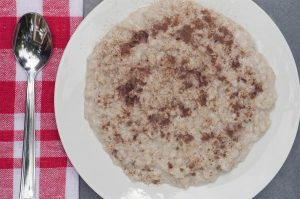 It may taste bitter by itself, but you can simply add 2-4 Tablespoons in foods like oatmeal, smoothies or shakes to make a delicious addition to your healthy diet. You’ll find cocoa powder in the baking aisle at your local grocery store. Robert Where are the miles program? Our miles program is run by Melissa White through Fly to Find a Cure. You can contact her at mwhite@nfcr.org or visit nfcr.org/miles to donate. I love dark chocolate! After reading your article, I will switch to powder cocoa. Thank you for the information. I’ve been using powder cocoa for a long time but didn’t know how beneficial it is. Hi Vicki, we polled a few folks asking them to respond to the no smoothies or oatmeal question and gathered a few suggestions: Sprinkle cocoa on bananas and cottage cheese or over berries (like raspberries, strawberries, blueberries). Hope this helps- Thanks for commenting! Thanks so much! Keep checking back for more cancer-fighting tips. Very disappointed to see the author of this article siting cocoa butter as having “unhealthy saturated fat that can raise cholesterol levels and increase your risk of heart disease when consumed in excess.” First, cocoa butter comes from a fruit and as such, it’s a very healthy fat containing primarily oleic acid, the same fat found in olives, avocados and many nuts. The saturated fat in chocolate is stearic acid, which has been shown to metabolize as cholesterol-neutral in the body. Numerous studies have shown dark chocolate to increase HDL’s and lower LDL’s, exactly what you would hope to see in the war against cholesterol, an effect due to is very high level of antioxidants. Secondly, dietary cholesterol only accounts for less than 10% of the cholesterol measured in the blood. If you truly want to lower cholesterol, cut out sugar and grains, which both raise insulin in the blood–a major contributor to high cholesterol. See Mary Enig’s book “Know Your Fats” for comprehensive information about fats and the body. We need fats to help shut off the appetite and keep hormones balanced, the key is to get the right fats, and chocolate contains good fats. While I agree that cocoa powder is an excellent way to get the benefits of chocolate without excess calories, 70%+ dark chocolate has also shown to have numerous beneficial effects against cancer. When enjoyed with tart dried cherries and whole almonds, it makes a fabulous snack and an uplifting relief to those suffering from such a debilitating and life-threatening disease.